For those of you who don't know, I make the Patch Shield Kit that sells through Adafruit. I just shipped another batch off last week (thank you to everyone who made that necessary BTW), and figured I'd share some of the tricks I've learned. 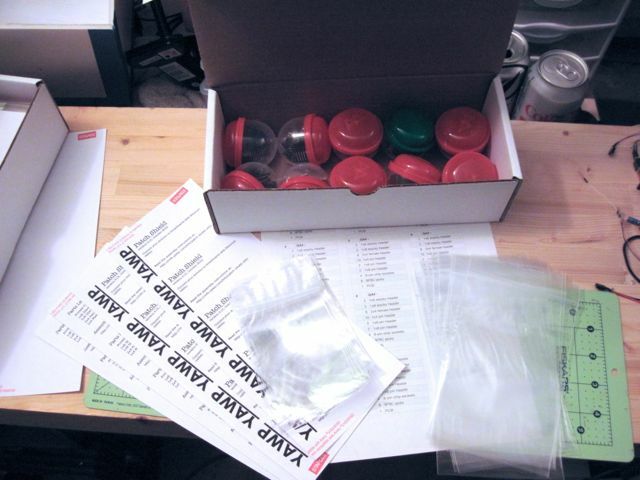 Kit packing involves repeating a complex series of individually simple operations. It falls into a general category called 'diligence tasks'. As a rule, humans don't perform diligence tasks well. The more times you run through the sequence, the easier it gets to remember doing any particular step, but the harder it gets to know if you're remembering the latest pass or some previous one. Everyone thinks they're smart enough to keep track of things, and eventually everyone gets caught making mistakes. I certainly have. Thing is, turning it into a question about the intelligence of the person doing the work misses the point. Any process that can fail silently is a lousy process. Any process that can fail because the person doing the work "wasn't smart enough" is a lousy process. Move information out of the head and into the world. "Information in the head" is stuff you can only learn by asking the person who knows it. "Information in the world" is stuff you can read from the system itself, or from some record attached to it. 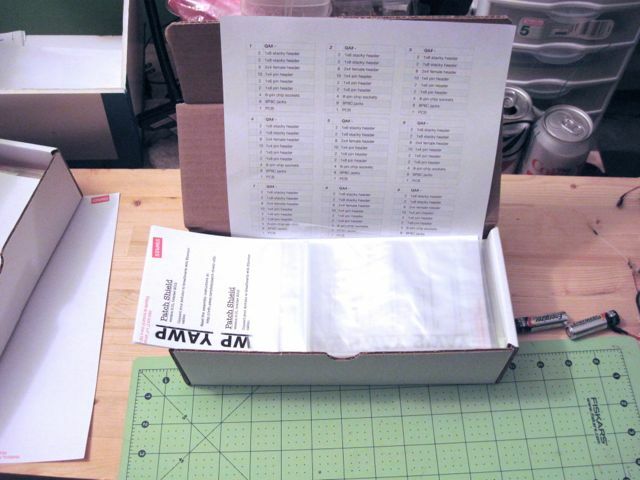 Checklists are among the simplest records you can attach to a system. They're cheap, easy to make, and highly effective. Studies by the military and hospital pharmacies have shown as much as a 90% reduction in errors when people use checklists instead of "just remembering things." I use two kinds of checklists for the Patch Shield. 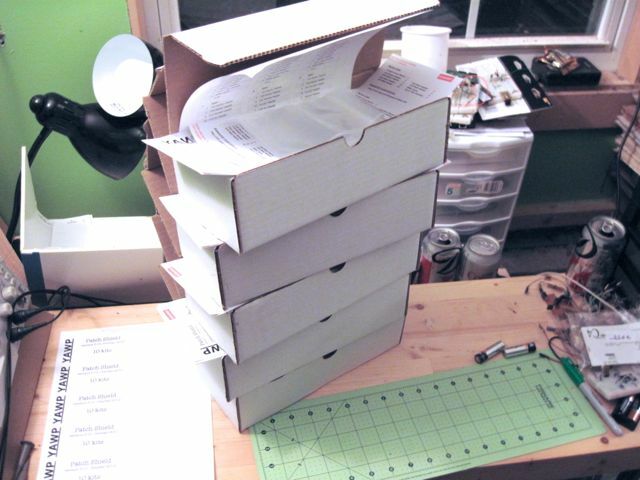 One holds information about the shipment as a whole, the others hold information about batches of kits. Multiplication is a wonderful thing. It's easier to count and verify five batches of ten items than it is to count and verify a single batch of fifty items. 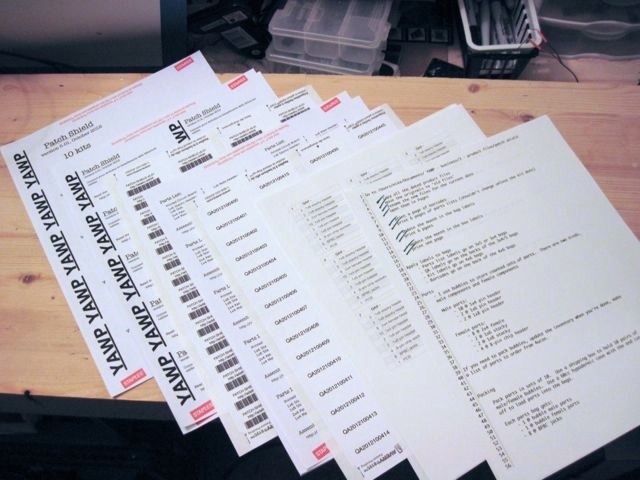 Collecting parts for a job into batches makes your process self-verifying. It's easy to miscount a single group of things, but hard to miscount several groups of things the same way every time. For even better results, use pallets or trays that hold the exact number of parts you want and/or work in batch sizes that are easy to palletize. Yes, using pre-counted parts is cheating to some degree, but I already had them counted a few weeks ago. I'll still cover most of the counting process in a later post. As for the containers, they're vending machine bubbles. I used to work near a vending machine that generated several hundred empties a week, and part of my job was to take them in for recycling. The official stance on keeping some for myself was, "we don't care." They offer mixed advantages for storage. On the positive side, they're cheap, transparent, rugged, and have lids that snap shut. On the negative side they're nearly spherical, which makes them hard to orient and nearly impossible to stack. It just so happens that ten of them fit comfortably into the box that will eventually hold the packed kits, and I'm wiling to take advantage of a happy coincidence if one falls in my lap. Now I can safely ignore 80% of the job and focus on 20% at a time.